Update 10:50, the live feed can be found at the Converse Kentucky Classic website. 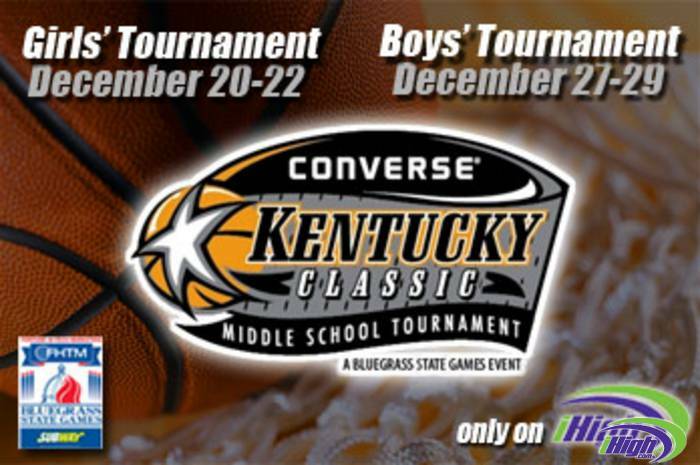 he Bluegrass State Games and iHigh will be hosting a statewide Middle School Basketball Tournament this year in Frankfort around the Christmas Holiday. It is open to all Middle School Teams, both boys and girls, across the state and will be conducted as a part of the 2010-2011 Bluegrass State Games. The Tournament is designed to provide opportunity for all Middle Schools in Kentucky to compete in a Middle School Tournament under the Bluegrass State Games program. The Tournament is constructed in a double elimination format which guarantees all participating teams two (2) games. There will be t-shirts for all participants, medals for winning teams, award/recognition for the top student athlete from each team, awards for All-Tournament Team as well as Tournament MVP. Games will be broadcast on Tuesday and Wednesday live on iHigh.com and sent out around the world on America's largest school sports Network, iHigh.com.